Whether you need an industrial pail with an easy-pour spout or a dispenser, we have just what you’re looking for. Use our different colored industrial pails to distinguish front and back of house cleaning supplies from one another, keeping your risk for dangerous contamination low. 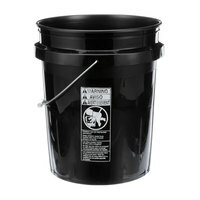 Keep your restaurant or business clean and sanitary with a heavy duty pail that will stand up to your everyday use! You know the importance of keeping your commercial establishment clean. Whether you run a restaurant, hotel, bar, or office building, use plastic buckets for your cleaning needs. Whether you need to keep sanitizing solution on hand, or simple hot and soapy water, we have the heavy duty pail that will withstand heavy usage. With our selection of styles, capacities, and colors, we’re sure to have industrial pails to suit your needs. Also try our scrubbers and sponges, window cleaning supplies, and dusters for all your commercial cleaning needs. If you're wondering where to buy delfield jugs, buckets, and pails, we have a large selection of delfield jugs, buckets, and pails for sale at the lowest prices.